Yamaha MusicSoft is proud to announce the latest premium voice pack for the Tyros5 Arranger Workstation! 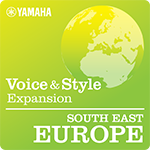 The South East Europe pack includes a huge variation of styles and voices from Romania, Slovakia and Hungary - perfect to play traditional and modern music. Explore the vivid spirit of Cymbalom-driven Romanian Folk and the magic of Hungarian Csardas, Gypsy Swing and Slovakian rhythms! As a composer, I’m constantly listening for new ideas. Whether it be a new style to write in or new sounds for musical inspiration, my first stop is the Yamaha MusicSoft library. This pack includes a whopping 40 Styles, 64 Voices, 15 Multipads and 80 registrations to add to your sonic palette. I encourage you to explore all of the different expansion packs that are available. Some new found instrumentation may be all that your next great composition needs! Check out the demos of this new pack and let us know what you think by leaving a comment below. Is music part of your 4th of July? Play along with Nashville session musicians!